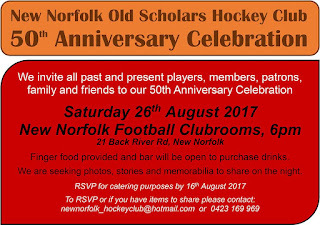 New Norfolk NEWS: Hockey one, hockey two, hockey 50! THE 50th anniversary of the founding of the New Norfolk Old Scholars Hockey Club will be celebrated with a function at the football clubrooms later this month. The evening will bring together past and present players, coaches, office bearers, patrons and supporters. The club was formed in 1968 under coach Josie Davis and entered into the 4th Grade of the Southern Women’s Hockey Association. The team trained under one light on the old Royal Derwent Hospital oval (now Woolworths) and played all its games on Saturdays. Local teacher Elaine Browning was the first to score a goal for the club and followed that record with the club's first hat-trick in the third game of the season. The club couldn’t have started with a better result, taking out the premiership in 4th Grade. In 1969 the club welcomed Marion and Brian Eccles who would become the backbone of the organisation. In 1970 the club entered a second women’s team into the association and by 1972 there were three women’s teams competing. It wasn’t until 1979 that a men’s team was formed, mainly sourced from the supporters of the women’s teams. The club peaked in 1997 with eight teams wearing the orange and brown uniform. Training sessions and coaching offered by club members through the local schools saw the introduction of some underage girls' and boys' teams. The club evolved into a real family with all varieties of relations taking to the field together. Some of the social events over the years included hosting games against visiting US Navy teams, June long weekends in Devonport, a "pimp, punks and tarts" night and travelling to the Albury Carnival to compete. Fundraising was just as important on the social calendar with wine bottling, drag nights, manning “Tynwald Tucka” at various country shows and attending the Australia Day Races at Kensington Park. In 1987 hockey changed dramatically with the construction of the Tasmanian Hockey Centre at New Town. The astroturf surface now allowed hockey to be played any day or night of the week in any conditions. The artificial surface also had the effect of putting the New Norfolk club at a disadvantage compared to those with easier access to the facility. Stalwart Marion Eccles passed away in 1993 and it was agreed that the White Rose of Yorkshire be adopted as the club emblem to signify the commitment Marion had made to the club. Although Hobart based clubs offered better training facilities and fielded teams in all grades, those who played for the NNOSHC seemed to bond and the club now boasts numerous players that have attained high milestone games. Lee Smith achieved a club record of 663 games in 2015 and continues to play as goalie in the 2017 season. Joining Lee on the field this year are Natalie Browning with over 500 games, Sally Smith, Leonie Smith and Lyn Springer with over 400 games and Shan Stock with over 300 games. The current team competes on Sundays in 3rd Grade and although their training days are over there’s still a competitive philosophy and a great team spirit. The team is looking to recruit for next year and would love to see new or “old” players take to the field. It is anticipated that the 50th anniversary event will see guests travel from interstate to join with the many locals for an evening of storytelling, catching up and most of all laughter. The event kicks off at 6pm on August 26. Light refreshments will be provided. The club would welcome any old photos, uniforms, trophies and Gazette clippings to share on the night. Please contact Natalie on 0400 044 172 or Lee on 0419 320 382 for further information. For catering purposes an RSVP by August 16 would be appreciated.